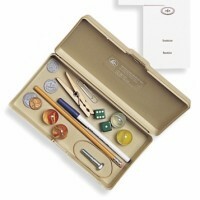 All the items needed for evaluation are contained in one convenient kit. This handy kit contains 17 common items and matching cards for the evaluation of stereognosis. The 3" x 5" (7.6 x 13cm) cards are laminated for long-term use. Each card has a drawing and the name of the item in Spanish and English. The name is on the back of each card. Use this kit with the Sensory Testing Shield to retest clients and monitor improvement during treatment. Packaged in a sturdy plastic box.